Making Tax Digital (MTD) seminar at the Derby Enterprise Centre. 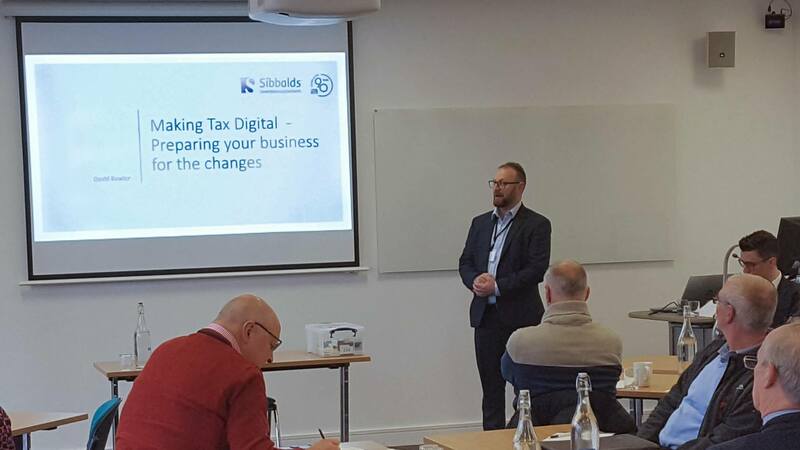 With the Making Tax Digital (MTD) deadline looming fast, Sibbalds recently held an informative seminar for a number of its clients at the Derby Enterprise Centre. Members of the Sibbalds’ team, presenting at the event, looked at what Making Tax Digital is and what it’s introduction will mean for both for HMRC and businesses. Discussions about how clients could best seize the opportunities that result from the changes then followed, rounded off by a lively Q & A session. The seminar was thoroughly enjoyed by all those attending and was so successful that Sibbalds are repeating the event on February 26th. Contact david.bowler@sibbald.co.uk for an invitation to the next event. We look forward to welcoming you. I joined Sibbalds in January 1997 and deal mainly with corporate accounts and taxation matters. I have considerable experience with Sage 50 Accounts and also have a reasonable understanding of other accounting software packages, such as QuickBooks, Xero and a number of payroll packages. I can also assist with software installation and the simpler IT hardware and networking issues.